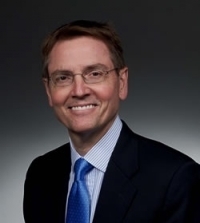 (March 19, 2014) — Lexington Mayor Jim Gray will lead the next event in the "see tomorrow." Speaker Series at 4 p.m. Monday, March 24, in the William T. Young Library Auditorium. As one core tenant of the plan focuses on UK's community impact, Gray will discuss "town and gown" relations between the university and the city. "UK President Eli Capilouto and I often quote the late Senator Daniel Patrick Moynihan who said that 'to create a great city, you create a great university, and you wait 200 years.' UK is nearly 150 years, and we’re seeing the fruits of that growth and partnership between university and community." The former CEO of international construction firm Gray Construction, Gray became Lexington's mayor in 2011. He will be the fourth speaker in the "see tomorrow." Speaker Series, which is sponsored by the UK Senate Council and Office of the Provost. Past speakers have included John Thelin, a UK educational policy studies professor; David Attis, a practice manager with the Education Advisory Board; and Kathi Kern, director of the UK Center for the Enhancement of Learning and Teaching. "President Capilouto and I strongly believe that "see tomorrow: The University of Kentucky Strategic Plan" cannot be a document that simply sits on a shelf. It must inform what we value as an institution, how we bring those values to life and how we fund those aspirations," UK Provost Christine Riordan said. "An ongoing speaker series provides an avenue to continually remind us all that the strategic plan is never complete. It is an ongoing process of continuous improvement and aspiring to do more on behalf of the Commonwealth we serve.